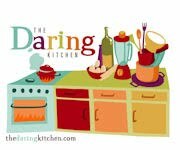 This month's daring cooks challenge was proposed by Michelle from Veggie Num Nums. The challenge was to prepare a mezze table, a collection of small dishes from the Mediterranean. What a fun challenge. I have a number of Mediterranean cookbooks and was looking forward to trying out some recipes. Michelle had one stipulation, we must use her hummus and pita recipe. Her hummus recipe was delicious. The recipe calls for a little more lemon juice than I usually add, but we all enjoyed it. Apparently, pitas should puff when you cook them, like blowfish. Some of mine puffed, some didn't. I wasn't sure if the baking stone lost heat between patches or I needed to roll them out thinner. Michelle had a couple of ideas for some dishes for the mezze table. She had a shot of a jar of preserved lemons. Preserved lemons are a condiment used commonly in Morrocan cooking. Most recipes take several weeks. I found a quick preserved lemon recipe on Cooking Light's web site. I washed and quartered two meyers lemons and boiled them in 1 cup of water with two tablespoons of Kosher salt for 30 mins. The lemons were a big hit. Unusual, tart and delicious. 1. Peel cucumber, de-seed, and dice. Blot off moisture with paper towels. 2. Toast cumin seeds for a few seconds in a small, heavy frying pan over high heat. 3. In a bowl, stir yogurt until it is smooth. 4. Mix it with the cumin, garlic and coriander or mint leaves (I used some grated radish instead). 5. Stir in the cucumber and sprinkle with cayenne or paprika, and chill before serving. I decided to try one of my newest cookbooks, The New Mediterranean Diet Cookbook but Nancy Harmon Jenkins. All of the recipes that we tried we delicious. After pouring through the cookbook, I came up with a menu for my mezze table. Going clockwise in the picture above, start with preserved lemons, seasoned olives, cucumber raita, humus, melitzanasalata (spicy grilled eggplant dip), grilled pork, feta, tunisian aijjah with spicy potatoes . In a large skillet, med heat, sauté the potatoes in 2 T o.o, until softened and browning, about 15 mins. While they are cooking, pound the salt and caraway to a powder in a mortar, then add the garlic and form a paste. Dilute the tom puree with the warm water, stir in the hot sauce, combine with the garlic paste. When the potatoes are done, at this to the pan, stir for 5 – 10 mins, until liquid is reduced to thick sauce. Taste and adjust seasoning. Beat the eggs with a fork, add to pan, lift to let eggs run under pan. When eggs are at desired consistency, remove from heat and serve. Perhaps our favorite was the Melitzanasalata. We poked an eggplant with a fork a dozen times and then grilled it for about 20 mins. We blackened 2 poblanos. When they had cooled, we combined their flesh with 1/2 cup plain yogurt, 2 T olive oil, juice of half a lemon, clove of crushed garlic and salt. I used an immersion blender. Great job on the challenge! Your mezze looks amazing =D. The Tunisian Aijjah with Spicy Potatoes sounds scrumptious. It's on my to-do list now! Good job on the challenge. I enjoyed it a lot, too. Have never made mezze before, either ;o). amazing version. love the picture and I will have to try the Tunisian Aijjah with Spicy Potatoes. Great job on your challenge and your mezze looks delicious. Your food is fabulous and your presentation is just gorgeous! I love that you made so many extra dishes, and now I'm going to buy The New Mediterranean Diet Cookbook because the recipes look delicious. I can't wait to make the Tunisian Aijjah with potatoes--what a neat recipe! You did a great job with your mezze-I love all the different dishes. Will have to try the potato dish-sound fabulous. That Ajjah dish sounds outstanding. It has almost all of my favorite weekend breakfast ingredients. I will be making that coming weekend. Lovely feast. This was a great challenge! That looks utterly awesome and delish. I should probably get my hands on a (non-vegie) Middle East cookbook and start making some of these dishes as they do remind me of my grandfather's cooking and I suppose I should offer a nod to that side of my heritage. Once the BBA Challenge is over, which should be this weekend. I would recommend this one. The recipes have all been delicious.